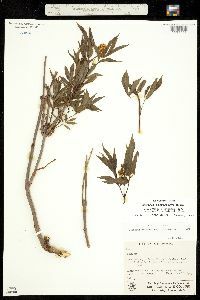 Shrub to 3 m tall Leaves: opposite, pinnately compound. Leaflets five to seven, 5 - 12.5 cm long, lance- egg-shaped to narrowly oblong with pointed tip, finely toothed, often softly hairy beneath. Flowers: borne in large, egg-shaped terminal clusters (cymes), white, 3 - 4 mm wide, numerous. 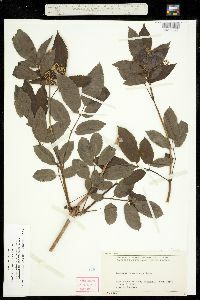 Cyme about as long as broad, with an evident main axis extending beyond the lowermost branches. Corolla five-lobed. Stamens five. Fruit: berry-like (drupe), juicy, in clusters, bright red (seldom white or yellow), 5 mm long. There are three to five stones inside each drupe. Twigs: finely hairy when young. Pith brown. 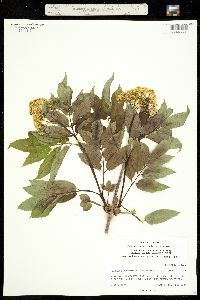 Similar species: Sambucus canadensis is similar but has flat-topped or dome-shaped cymes, a white pith, fruit that is dark purple, and a flowering time that begins in June. Habitat and ecology: Frequent in mesic and swampy woodlands. 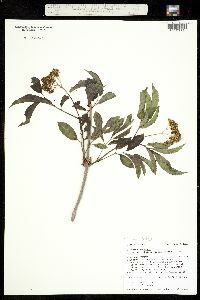 Notes: Though a favorite food of birds, the bitter fruit will cause stomach upsets in people if eaten in quantity. 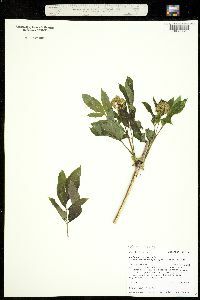 Etymology: Sambucus comes from the Greek word sambuke, a musical instrument made of elder wood. 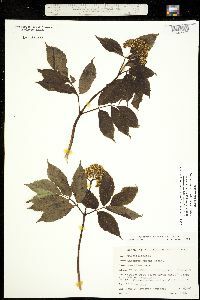 Racemosa derives from the Latin for "having a raceme" (a cluster of stalked flowers arranged along a central stem). Pubens means downy. 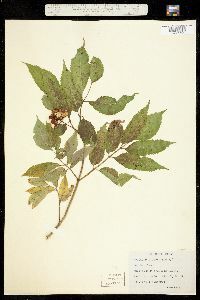 This species is restricted to the lake area where it is generally found in moist woods, in swamps where it is frequently associated with black ash, and rarely on dry ground where I found it associated with beech and sugar maple. 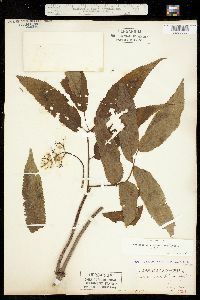 Shrub to 3 m, the younger parts usually finely hairy; pith brown; stipules minute or none; lfls 5-7, lance-ovate to narrowly oblong, acuminate, finely toothed, usually soft-hairy beneath; infl pyramidal or convex, panicle-like, with an evident main axis extending beyond the usually paired lowermost branches; fls white, 3-4 mm wide; fr red (seldom yellow or white), 5 mm; 2n=36 + 0-2 B. Rich woods; circumboreal, in Amer. from Nf. to B.C., s. in our range to Pa., Ind., Ill., and in the mts. to N.C. May, June. The N. American ssp. pubens (Michx.) House is represented in our range by var. pubens (Michx.) Koehne. (S. pubens) Other vars. are cordilleran.